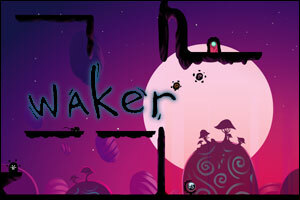 Waker is a puzzle / platform game set in the world of a child’s broken dream. “As the Waker, you uses both mind and reflexes to solve puzzles, creating platforms to form a safe path through the dream worlds. Waker was developed by students from the Singapore-MIT Gambit Game Lab. Nice Game, And I Really Liked The Way They Made The Game, To Make Your Own Path! This Game Has No Answer, It’s For You To Decide! Just starting, though I find the concept interesting already! What beautiful art work as well as a Zen concept. Thanks for this one! Posted on Friday, August 28th, 2009. Follow any responses through the RSS 2.0 feed.